RDF and Linked Data have broad applicability across many fields, from aircraft manufacturing to zoology. Requirements for detecting bad data differ across communities, fields, and tasks, but nearly all involve some form of data validation. This book introduces data validation and describes its practical use in day-to-day data exchange. The Semantic Web offers a bold, new take on how to organize, distribute, index, and share data. Using Web addresses (URIs) as identifiers for data elements enables the construction of distributed databases on a global scale. Like the Web, the Semantic Web is heralded as an information revolution, and also like the Web, it is encumbered by data quality issues. The quality of Semantic Web data is compromised by the lack of resources for data curation, for maintenance, and for developing globally applicable data models. At the enterprise scale, these problems have conventional solutions. Master data management provides an enterprise-wide vocabulary, while constraint languages capture and enforce data structures. Filling a need long recognized by Semantic Web users, shapes languages provide models and vocabularies for expressing such structural constraints. 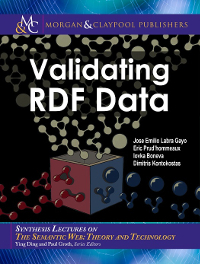 This book describes two technologies for RDF validation: Shape Expressions (ShEx) and Shapes Constraint Language (SHACL), the rationales for their designs, a comparison of the two, and some example applications.